Even as someone who loves keeping myself in shape, as soon as those cold stormy nights hit, going for a ride on my bike in the wind and rain is the last thing I want to do. Why do I want to experience the cold myself when I can stay wrapped up warm of the sofa and watch a Game of Thrones marathon and just let Jon Snow tell everyone else how winter is coming? Sure, there are indoor exercise bikes to keep you cycling like an olympian year round, but what about one you can use all day when at work? The best under desk cycle will allow you to enjoy a workout and stick to your fitness regime as you sit at your desk during office hours. I know right, talk about convenience! A desk bike is a seatless bike that fits under your workspace or anywhere you’re sitting like on the sofa at home as you watch TV. Instead of hitting the roads or venturing to the gym, you can get your cardio workout anytime, anywhere. Responding to endless lists of emails (or swiping right on Tinder) has never been so healthy! Let’s see how you can enjoy exercising while at your desk, before looking at some top-selling under desk cycles. While finishing up the end of a monotonous work day you could imagine you’re cycling through the hills of Florence on a summer’s day—what a nice idea that would be! Under desk cycle with a wide range of magnetic resistance. Lower pedals than competitors to fit under most desks. LCD display to track your progress. Heavy duty under desk cycle with 220 pounds capacity. Pedals can also be used with hands as arm exerciser. 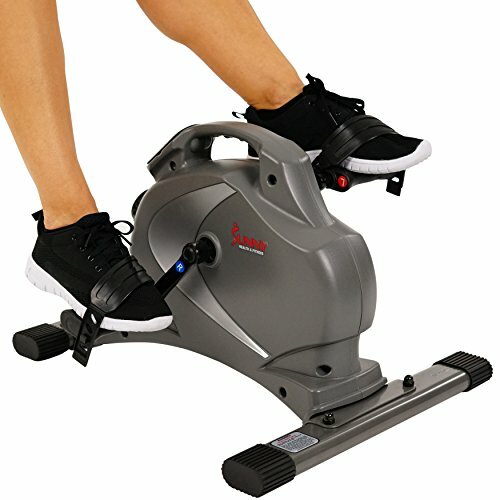 Foldable and lightweight pedal exerciser for legs and arms. Cool Rev Technology stops it getting too hot. Five function LCD display shows time, revolution count, revolutions/minute, calories burned and distance. 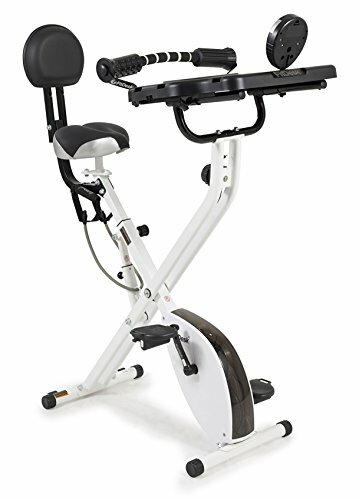 Compact pedal exerciser provides low impact workout for arms and legs. Portable and can be used anywhere with non-slip rubber feet. Unique desk and exercise bike combo. Large 16 by 9 inches desk with easy access drawer. 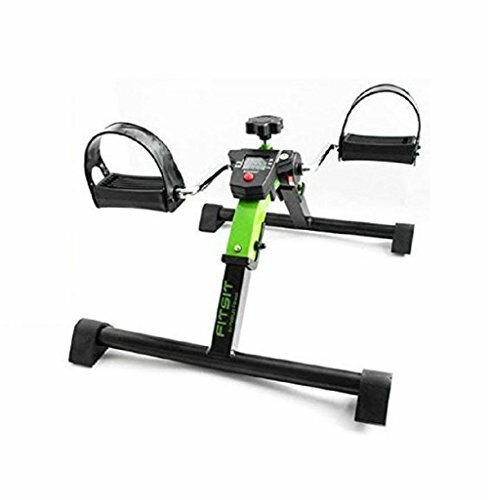 Exercise bike with eight levels of magnetic resistance. Why Choose an Under Desk Cycle? A new survey by Ergotron says 86 percent of Americans are sitting all day, every day. In total Americans are sitting an average of 13 hours a day and sleeping for eight more hours. Scientists even found that not exercising and sitting all day is as dangerous as smoking or being obese. Weight gain and all the side effects, heart disease, increased risk of stroke and diabetes to name but a few. The best under desk cycle is an easy way to combat these problems. Moving your body, even at a leisurely pace will have massive health benefits. You’ll burn calories to help lose weight which improves your overall health and reduces the pressure on your joints and organs. Exercise also triggers important processes associated with the breakdown of fats and sugars. Seated exercise is great for getting a low impact yet productive workout. For people in rehabilitation from surgery or those with mobility or balance issues, an under desk cycle is a safe way to get all the benefits of exercise. You could even combine an under desk peddler with some chair yoga exercise like these shown in the following YouTube video, for a more effective workout. Just like any exercise routine, using an under desk cycle comes with a small amount of risk. Always speak to a medical practitioner before embarking on any new physical activity. Your job may be tiring, but nobody wants to find you having a heart attack at your desk. Make sure your chair is stable and doesn’t have wheels. Sometimes a strap can anchor your chair or desk to prevent both the cycle and your chair from moving. If your desk is low, it may be advisable to look at an elliptical trainer where your legs won’t lift as high. Always apply force downwards, not forwards, just as if you were riding a real bike. Begin with the lowest resistance and build it up. And try to keep your upper body still so your legs do all the work. You can change your routine later and place many under desk cycles on top of the desk for an arm workout. Finally, it’s advisable to check with your employers and fellow employees whether they have any objections to an under desk cycle in the office. Who knows, once they see yours, your office might just turn into a midday spin class! You may not have heard of under desk cycles before, but when you look, there are a lot of them available. With so many choices it’s difficult to decide which is the best under cycle desk for you. Start by ensuring the cycle you choose will fit in the space you’re looking to use it. If your desk is too low, then you may be better choosing an elliptical trainer or step machine for your lower body workout. A more compact machine will also be more portable for easy transportation between your front room and the office. The resistance level of the cycle will determine how effective a workout you get. Most under desk cycles now come with magnetic resistance which has the benefit of being super quiet. The last thing we want in the office is a noisy exercise bike next to our desks, we already have the shredder for that. Match the cycle you choose to your ability level. If an under desk cycle is advertised as ideal for rehabilitation or low impact workouts, it won’t offer the resistance for an intense fitness session. Adjustable resistance will allow you to vary your routine and build up as you get stronger. We’ve looked at many of the top-selling models to help save you time when selecting an under desk bike. Here are the top five under desk cycles. Our favorite under desk cycle has all the features you’ll need. Eight calibrated resistance settings make your workout customizable. And an LED display shows your speed, time, distance traveled and calories burned to keep you in check. Made with high-quality components, this exerciser has one of the lowest pedal heights available at only 10 inches it’ll fit under your desk. The magnetic resistance is quiet when using to avoid disrupting your coworkers. A smooth pedal motion is healthy for your joints and won’t distract you from your work. Lower pedals mean it’ll fit under the desk. Eight levels of magnetic resistance. Resistance dial is flimsy and often breaks. Pedals are too low to ground for users with larger feet. You may need to lower your chair or desk. 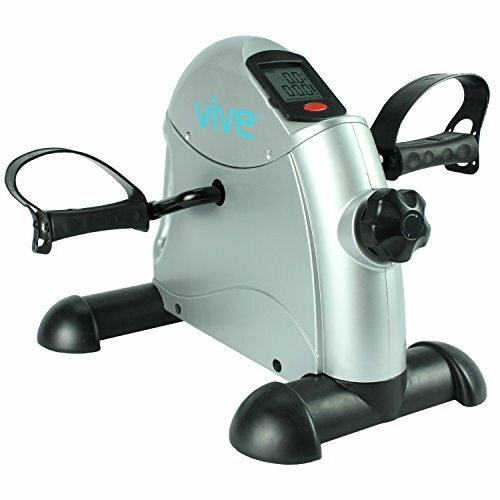 A heavy duty mini exercise bike, this can take weights up to 220 pounds. Designed to be portable, a handle makes it easy to carry from home to the office. Eight levels of resistance are offered by a micro tension controller. What we liked about this mini bike was the pedals with safety straps attached. You could just as easily use the pedals with your hands at home or as an under desk cycle in the office. An LCD display is clear and easy to read, telling you how many miles you’ve covered while finishing that report. Durable build supports up to 220 pounds. Can also be used for upper body with hand peddling. Quiet resistance won’t disturb coworkers. May struggle to fit under standard desks. No grips and the unit slides on carpets or softer floors. Tension control is too light for some users who keep it maxed out all the time. This lightweight under desk cycle folds for easy storage and transportation, no tools are required to reassemble it. What makes this stand out from many competitor products is the patented Cool Rev technology which prevents overheating of the bike. In a confined space like under a desk the last thing you want is hot metal in close proximity to your legs. A tension control dial provides adjustable resistance with a large LCD displaying all your workout statistics. An easy to clean powder coated finish is available in a choice of five colors. When folded this makes an ideal travel companion for those business trips away or being on the road. Lightweight and foldable for easy storage. Won’t get hot no matter how hard you workout. Solid metal build with a choice of colors. Easy to use for both legs and arms. Small cycle which larger people or with larger feet may struggle to fit. Tension can loosen when pedaling. This compact pedal exerciser is one of the most versatile we looked at. It can be used on any flat surface with rubber feet that keep it from slipping on wood or tiles. And at only 12.5 inches tall it’s easy to slide under most desks with a built-in handle for portability. You could even place it on top of your desk for an upper body workout at lunchtime without fear of marking the desk. A large dial at the front controls the adjustable resistance to customize your workout. A large LCD display shows your rotations per minute, calories burned, time elapsed, speed and distance covered. For rehabilitation of joint issues, this cycle provides an ideal low-impact workout. Non-slip and non-marking rubber feet for stability. Adjustable resistance with easy-to-use dial. Compact design for under desk. Resistance may not be intense enough for many healthier users. Toe straps are stiff and dig into feet. Pedal actions can be jerky. Not an under desk cycle but another option for keeping active as you work is to attach a desk to your exercise bike. Better suited for those who do most work from home on their laptop, FitDesk has done all the work for you. Not only does it ease the need for a separate desk, but a twin belt, high-velocity flywheel keeps you upright, active and focused. A compact steel frame design folds with built-in wheels for easy storage. An eight position magnetic resistance provides a smooth and even pedal motion with a frame mounted knob for an easier or harder workout. The latest version of the DeskFit even has padded and contoured massage rollers on the adjustable armrest which could help relieve typing strain. Included resistance bands can be used for an upper body workout for those breaks in the working day. Easy access drawer for your work. Massage bar for support and comfort. Only suitable for home office work. Larger computers may wobble on the desk. Those sedentary days in the office hunched over a sales report or behind a computer screen just got a lot healthier. The best under desk cycle is a smart way to get healthy and prevent life threatening conditions. And you’re being paid for it too! 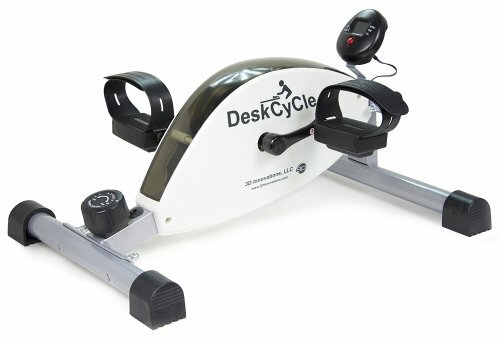 Although there are many under cycle desks available, the Desk Bike Pedal Exerciser is the best under desk cycle available today. Lower pedals mean it fits under your desk and there’s no fear of banging your knees when using it. A whisper quiet eight levels of magnetic resistance means you can perform even the most intense of workouts without disturbing your colleagues. And the compact design means you can take it home to carry on pedaling in front of the TV too!